To which post? I recall that these photos were included in the email trail pertaining to this post…. Let me know. Anil Advani. These pictures should be part of another post altogether!! Mr Zachariah was a true sincere teacher who took pain to see that the student understood the issue.I use as usaual fool around but he never minded as he kneww i ment no harm and was serious student when it came to learning . IPlease pay my condolences to the family and pray God gives soul heavenly peace. we areall mortal and one day we have to leave this world. Extremely sad to learn of Mr. Zachariah’s demise. kids much admired and wished to imbibe. taking our respective places in sombre Chapel ,one fine day. I’m extremely sorry to hear of the sudden passing of our great friend Matthew Zachariah. I remember in the 50’s when he was staying in the Remove building close to my quarters very often we talked of many different things. I found him to be an extremely brilliant teacher whose main interests were academic matters, the teaching profession, and pedagogic philosophy. He was a good musician and known for playing the Hammond organ and piano in the school chapel to help the congregation in their prayers. His winning the Ford Foundation award was also a big achievement which took him to the U.S for his Ph.D. I also remember when he came to visit Toronto for a day and stayed with me. He had come to deliver a speech at the Sidney Smith Hall at the University of Toronto. Matthew seems to have lived a good life and his achievements were noteworthy and exemplary. God bless his soul. I would appreciate if you could please forward my condolences to his family. Convey our deepest condolences to his wife and children. It is with profound sorrow that Yvonne and I have learned of the passing of our one-time colleague Dr.Matthew Zachariah. The comments that are pouring in from Old Cottonians that were influenced by this remarkable man are a testimony to his character and brilliance as a teacher and the respect which was his due. Some of you may remember that he was also the organist and choir master. An eloquent debater, he once gave the students a demonstration of his skills at my request. I was proud to be his friend and colleague, and tried to stay in contact with him all these years, praying daily for his health and well-being and that a kidney transplant would be found for him some day. He dropped in to spend a day or two with us in Vermilion one spring many years ago, driving trough a precarious snow storm and hazardous road conditions to complete the long trip from Calgary. We also went to see him in Calgary, and on that occasion had the pleasure of meeting Mr. Ramesh Tiwari (who was visiting from Winnipeg) as well. 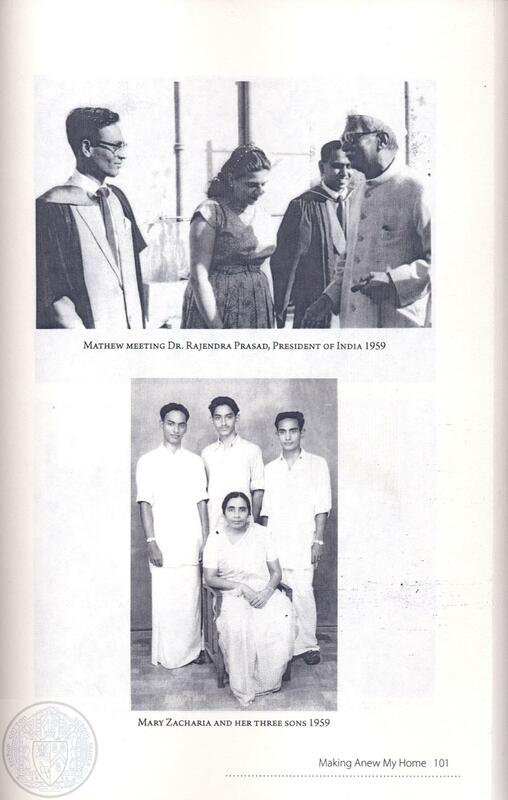 As an aside, in the picture you have enclosed, Mrs. Goss and I are standing alongside Matthew as he was being introduced to Dr. Rajendra Prasad. I believe it was the centennial year of the School. Our condolences to his family, friends, and former students. I am saddened to hear of the passing away of Mr. Zachariah. I do remember him well. Please convey my condolences to his family. I Pray ,God rest his soul in peace. A very special person with a lot of passion for teaching .